Abortion has been in the news a lot recently. There’s the ongoing attempt to curtail reproductive rights in Spain, there’s the burgeoning #protransprochoice petition> and now there’s Education For Choice’s new report on the sketchy quality of independent pregnancy counselling in the UK. Education For Choice (EFC) has spent the last two years investigating the centres that provide this counselling – Crisis Pregnancy Centres (CPCs). On Tuesday, EFC released a comprehensive report of its findings and believe me, if you’re pro-choice, it’s worth a read! Abortion has been in the news a lot recently. There’s the ongoing attempt to curtail reproductive rights in Spain, there’s the burgeoning #protransprochoice petition and now there’s Education For Choice’s new report on the sketchy quality of independent pregnancy counselling in the UK. Education For Choice (EFC) has spent the last two years investigating the centres that provide this counselling – Crisis Pregnancy Centres (CPCs). On Tuesday, EFC released a comprehensive report of its findings and believe me, if you’re pro-choice, it’s worth a read! The report revealed that there are approximately 135 independent Crisis Pregnancy Centres in the UK. Out of these 135, EFC managed to mystery shop 33 of the centres and attain recordings of the counselling provided. The recordings revealed a huge range in the quality of the counselling provided. Whilst in some centres the counselling was non-directive, non-judgemental and unbiased, the majority of CPCs that we investigated were found to be giving misleading information on the mental and physical health outcomes of abortion, and/or using inappropriate language and emotional manipulation when it came to discussing pregnancy options. A leaflet given out by a centre affiliated with Care Confidential (in 2012) (See transcript). 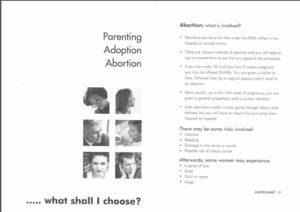 Three of the centres gave out this emotionally manipulative leaflet produced by an anti-abortion organisation in the States. Two centres offered ultrasounds with the express aim of stopping abortions from happening. Check out this leaflet from Tyneside Pregnancy Advice Centre which makes this clear (see transcript). Now, you’re probably thinking “Oh this is all terrible but isn’t it just a bunch of hardliners organising this?” And unfortunately the answer to that is a resounding no. The two biggest umbrella organisations running CPCs are, unfortunately, the most well connected. These are Care Confidential and LIFE. LIFE sit on the Government’s Sexual Health Forum and Care Confidential (along with the totally anti-choice group Image) work in women’s prisons. It’s so horrible to think that those with restricted access to healthcare may be being subjected to biased advice. All in all, this report has unearthed some pretty shocking findings. It needs to be shared around as much as possible and this is where you can help! Find your local CPC using this map and ask your GP if they’ve read the report and investigated that CPC. It’s vital that health professionals aren’t signposting pregnant people to these centres. EFC has a toolkit that involves a checklist for independent pregnancy advice centres that might come in handy. Pregnant people deserve accurate medical information and unbiased guidance to help them make the decision that is best for them and we are going to keep going until that happens. Read the full report here, share it, and follow Education for Choice on Twitter (@EdForChoice) for regular updates on the pro-choice movement in the UK! Thank you so much for producing this report, EFC. It really is horrifying that these centres are allowed to get away with this.